One of the primary goals was to build something that can be easily reproduced with “off the shelf parts.” All the parts are suitable for domestic water use, in case the water is consumed. The challenge in building this device was how efficient can I make the heat transfer portion so that not much fuel (charcoal) would be required. Another challenge was to retain the heat once the water was heated. It was also meant to be an educational tool for the Scouts. This device makes a good topic of discussion for the Energy merit badge. Later in this report I will review the calculations. A 5 gallon water container satisfied several requirements. It was large enough, it was insulated and has a spout at the bottom to easily draw water. A charcoal fire starter was the key to relatively efficient heat transfer. The device operates by placing some newspaper in the base of the unit and the charcoal is loaded into the top. When the newspaper is lit a draft is created similar to the stack effect of a chimney. This constant air flow gets the charcoal glowing much faster than if it were laying in a flat pan. Heat is radiated out where the copper pipe is. The fifteen feet of copper pipe is 3/8” thin wall, this made it easy to bend into a tight radius. Next some flexible tubing was needed to separate the water container from the heat source. Standard garden hose would not work here because of the high temperatures. A high temperature 3/8” hydraulic hose was purchased for the job. Finally brass bulkhead fittings and ball valves were used for the supply and return lines. The ball valves are closed when you want to fill the container separate from the heat exchanger and once the water is heated. The hoses slip on and off the copper pipe. When water is heated in a closed vessel a process called convection occurs. Simply stated warm water rises to the top since it is less dense than the cold water. This process is used in this device, the supply hose (bottom of the container) is connected to the bottom of the heat exchanger and the return hose (top of the container) is connected to the top of the heat exchanger. The container needs to be filled to the top for the water flow to begin. Since there is 21 feet of pipe ion this device, some resistance to flow was unavoidable. To overcome this resistance a marine primer pump was added. The pump has a check valve inside it so flow would go in one direction when squeezed. In testing it took approximately 45 minutes to raise 5 gallons of water from 60 degrees to 120 degrees. This is why the water heater works. Bear with me as I go through this. A gallon of water weighs 8.34 lbs. A British Thermal Unit (BTU) is the amount of energy required to raise 1 pound of water 1 degree Fahrenheit. Below is a calculation to determine the amount of heat needed to heat 5 gallons of water from 60F to 120F. I e-mailed the good people at Kingsford to get a vital piece of information, the BTU content of charcoal. They sent an answer the next day, it was 9,700 BTU/pound. 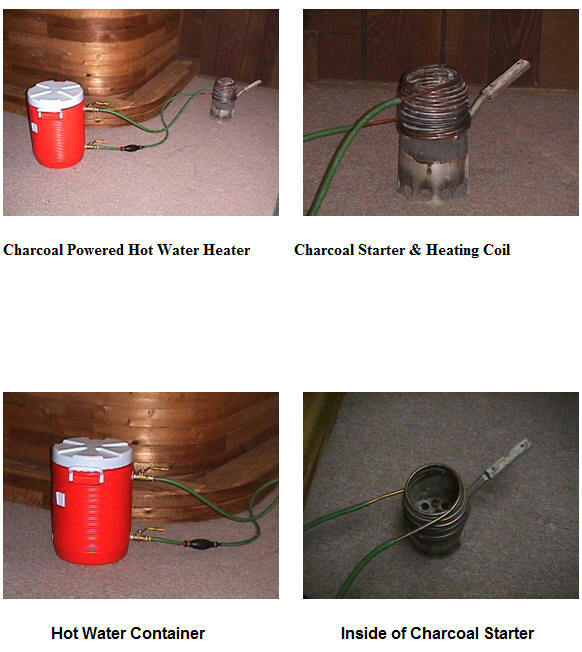 Using this information we can see that just 1 pound of charcoal is needed to operate the heat exchanger. This equals about 10 briquettes, which easily fits into the heat exchanger. I would like to thank Siemens Building Technologies for the donation of the copper pipe. I also got some good feedback from the students at Scoutmastership Fundamentals. They suggested adding the squeeze bulb and adding some type of baffle on the top of the heat exchanger to force more heat to in between the coils. I will give this a try on the next campout. During field testing some interesting things came to light. Do not close the valves while the coals are still hot, water turns to steam, steam builds up pressure to the point where one of the hoses blows off, creating a safety hazard. Once you are done heating water, disconnect the hoses from the heat exchanger so they can drain. On one campout the temperature overnight dropped to 12F, we were able to clear the ice from the hoses but could not de-ice the squeeze pump. On that cold overnight the heat retention of the container was truly impressive. The water was heated to roughly 120F at dinner time, not all the water was used, with the cover on the remaining water was still 90F the next morning. Quick disconnects would have been nice to have in place of the ball valves but they were a bit too expensive. The total cost for the materials was around $50.00. I already had the charcoal starter and the copper pipe was donated. This device cannot be justified solely on the savings of Colman fuel not used by the stove to previously heat the water. As I mentioned earlier its main purpose is to encourage Scouts to practice good sanitary habits. If they also learn and understand the engineering side to the device that is a bonus. If you are interested in building this device, feel free to call me at 513-755-7627 or e-mail at kathytony5@netzero.net. I am also interested in any improvements or ideas you may have to the existing design.